Ferndale Fire Marshal Brian Batten is usually more worried about saving lives and preventing disaster than engaging in political battles. But when he saw the need for a change in the way fire prevention and suppression systems are inspected in the building process, he got his State Representative involved. Together they helped navigate legislation through in a uniquely bipartisan way. SB 235 was approved by Governor Rick Snyder on Nov. 5, having passed almost unanimously in both the House and the Senate. (Democrats John Olumba of Detroit and Mary Rose Robinson of Lansing were the only ‘nays.’) The bill allows Certified Fire Inspectors to have the legal authority to register under Public Act 54 as fire protection system inspectors and plan reviewers, and to review and inspect all fire protection systems defined in Chapter 9 of the Michigan Building Code for new and existing construction. “Most people don’t realize that the [previous] law doesn’t allow that,” said Batten before the bill was passed. “It makes sense that the Fire Marshals should be able to go into a building and say ‘yup, that looks right,’ or ‘nope, you need to change that.’ But the way the law is now, it’s up to the city’s Mechanical or Electrical Inspectors. We don’t have any authority to go in and say what is right or wrong until after the building is occupied. In Ferndale and other cities with a full time building inspector, working together is common practice. Although even in those cases, having the Fire Inspector able to sign off on the fire prevention systems can save time for the other inspectors to focus on other things. In many communities there is not the budget for inspectors on staff. “Cut backs in staffing levels have caused reductions in full time Mechanical and Electrical Inspectors. Many communities have gone to contractual services using part time Mechanical and Electrical Inspectors. These inspectors may not have the education and experience needed, and they are relying on the Fire Inspectors anyhow,” he said. The legislation is completely optional. So if municipalities decide for whatever reason that they don’t want their Fire Inspectors to be part of the building process, they are under no obligation to have them be. “This just gives cities more options and more flexibility to use what resources they have. We’re in the best position to know how to certify these systems. It just makes sense,” Batten said. There is more to getting a bill passed than having a logical argument, however. Batten discussed his idea with State Rep. Ellen Cogen Lipton, and the second-term Democrat agreed with what Batten wanted to do. “This isn’t something political or controversial, but we still needed to come up with a strategy,” Cogen Lipton said. She pointed out that with Republicans in the majority in both the House and Senate, finding a Republican to introduce the bill would give it more of a chance of passing. “The first thing I did was talk to the Chair of Regulatory Reform on the House side. After that I thought it might make more sense to try and introduce it in the Senate first. I asked Brian if he knew of anyone else in his field that might be able to approach their Senator about it,” she said. “He mentioned his counterpart in Eaton County, and that person talked to Senator [Rick] Jones. Senator Jones ‘got it.’ He knew why this was important. 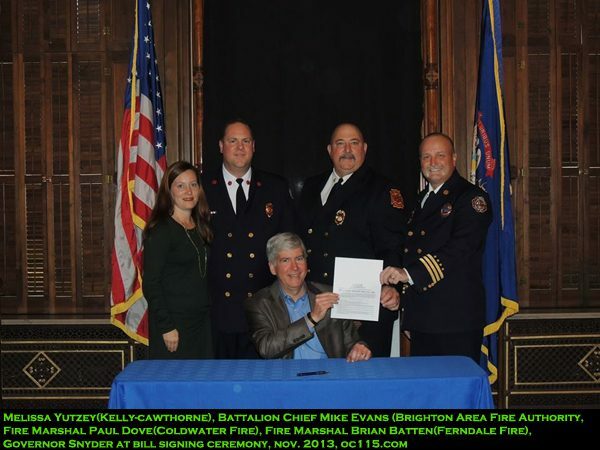 Batten teamed up with fellow fire professionals from the Michigan Fire Inspectors Society. Fire Marshal Paul Dove of Coldwater Fire Department & President of MFIS went to Lansing along with Batten to testify before the Senate committee. They encouraged their members to talk with their representatives about the importance of the bill. Batten is also a past President of the MFIS. SB 235 was passed with “immediate effect,” meaning communities can begin utilizing Fire Inspectors who are properly certified. For details of the bill see http://www.legislature.mi.gov/%28S%28yan5ksm24utgtvvfl2umyl45%29%29/mileg.aspx?page=BillStatus&objectname=2013-SB-0235.